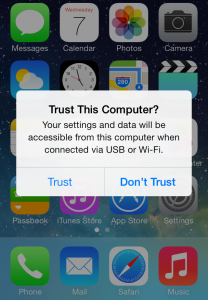 After updating to iOS 7, many Windows users have reported that they are constantly getting the ‘Trust this computer” message pop up even after selecting ‘Trust’ when plugging in their iPhone or iPad. Here is a list of common fixes to resolve this annoying message. The first step you should try is to update your iTunes. 2. Right-click the Apple device > Properties > ‘Hardware’ tab > Properties > ‘Driver’ tab > Update Driver.. When you connect your iPhone, iPad, or iPod touch to a new computer or another device attempting to access the files of your iOS device, you’ll be asked to verify that you trust the connected device. Tapping Trust will allow this device to access files stored on your iOS device. If your iOS device is passcode locked, you need to unlock the device before you’re asked to trust the connected computer or device. 1、Connect the computer or other device to your iOS device. 2、If your iOS device is locked with a passcode, unlock it. 4、If you’re about to sync the device with iTunes, click Accept. The trusted computer or device can access the files and settings of your iOS device. A trusted computer can sync with your iOS device, import photos, access movies and videos, contacts, and other such content, until you disconnect. The data stored on your iOS device is not exposed before you enter your passcode (if enabled) and choose to trust the connected computer or device. If you choose not to trust the connected computer, you can charge your device, but the connected computer won’t be able to access any content on your device. This entry was posted in Tips and Tricks and tagged ‘Trust This Computer’, ios7, iPad, iPhone, Stop ‘Trust This Computer’ Message by IosdroneD. Bookmark the permalink.